This was a level I made a while back for a competition on another forum. I thought I'd share it here in case others could get a kick out of it. It's not exactly a Mario Level. It's designed to be a Legend of Zelda dungeon made in SMBX. 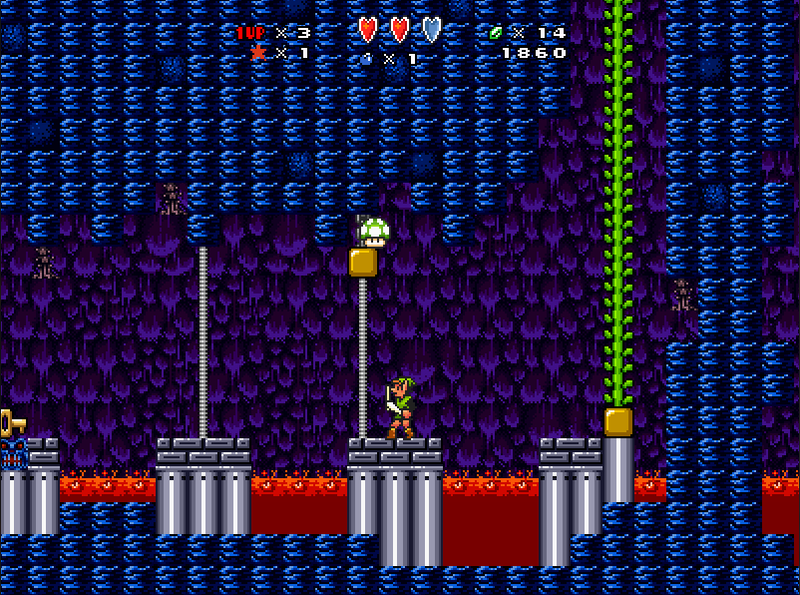 The theme of the level is hidden secrets. Here's a rundown of what you can expect from it. I wanted to do as much as I could with the fairly limited tools SMBX had available. One of my biggest goals was to make everything in the level have a purpose. If you can see something, there's probably something you can do with it. - If you're used to playing as Mario, you may want to familiarize yourself with how Link controls. Remember that he can block some projectiles with his shield, and pick up bombs by attacking them, then throw them with whichever button you have mapped to Alt Run. - There are secrets everywhere. If you can't even figure out how to get past the first screen, try attacking anything that looks even slightly out of place. - You keep stars even after dying, so I've added some hidden shortcuts that require a certain amount of stars to use. If you start repeating the level over and over trying to find everything, looking for shortcuts could give you an easier time. - If the obvious path is too difficult, try looking for an alternative path. The bullet-hell section is mostly skippable if you know what you're doing, but not if you want to get every ending. All graphical assets are either SMBX default or official sprites (and edits) from various Super Mario games, with a few exceptions custom-made by me. Music is ripped from Zelda: A Link to the Past, Star Soldier, and Psychonauts. If you have trouble downloading the above version, click here for a smaller version with no custom music. I'd recommend playing it with music if you can though, because I think it adds quite a bit. Feedback is welcome, but unless something is horribly broken for some reason (It shouldn't be. I tested it pretty extensively. But it was made in version 1.3, not 1.3.0.1) I probably won't go back and make any direct changes. Hi! Please stay positive and keep yourself motivated. You can do many great things if you give it your effort. Please have a lovely day. The Level doesn't seem to look good. It clashes with many styles and there's a lot of cutoff with the Metroid bgos. Also, don't put power-ups or mushrooms near lava because if they fall into the lava, you'll get Run-time error 9. I do see that you're new here so just for some advice try to play some of the levels from "The Best" section and read some smbx guides to help you on your level designing skills. Ness-Wednesday wrote: Also, don't put power-ups or mushrooms near lava because if they fall into the lava, you'll get Run-time error 9. As for the clashing styles, that wasn't really a priority for me. I was just working with what was available. I personally think it looks fine, but I can see how you'd think it clashes. I did make sure the enemies were consistent at least, but I wasn't going to start making custom backgrounds just for a simple level like this. If I had some intention of making more levels, I might do as you suggested, but in all honesty, I only came here to share this one, and that will probably be it. Still, the feedback is appreciated either way. This level had a mixed feeling from me at first but after giving it a fair play through then another, I feel I can fairly give my thoughts on this. The level isn't bad, in fact I enjoyed it. There was a lot to do and things kept you moving on, nothing stagnated felt completely linear and it was well put together in terms of that aspect. Enemy placement I may want to say seems excessive in some areas, but not to an unplayable degree. It wasn't bad but I feel somehow this could've been better. I also wanted to address a couple hidden items. Perhaps it was just me but I had a little issue at the start finding the first hidden key, but I feel someone with less patience would just give it up. I don't know it was just something I wanted to note. Music section is alright as well, but I especially like the choice when you turn into an angel and have to get that key while also avoiding the paragoombas. My thoughts are mixed, but it is clear: you made an effort and it shows. While graphics clash in some spots that's not really my main concern. My concern is whether the level is enjoyable and whether it's playable and this one is. My only major gripe would have to be possible excess of enemies in some areas. Thanks for the detailed overview. If you're interested, here's my rationale behind some of the things you took issue with. I felt like Link, with his sword, is pretty overpowered, so I could get away with putting a lot more enemies than you'd normally be able to in a Mario level. However, I feel like it's worth pointing out that there were ways to reduce the number of enemies. 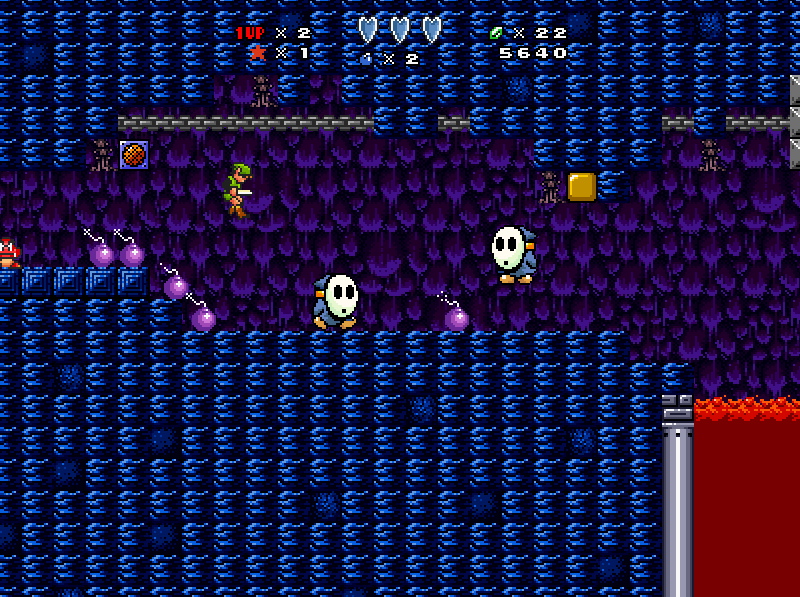 For example, when paragoombas infinitely spawn from pipes, killing the shyguy above them stops that. That's probably a little unintuitive for people who are used to playing Mario levels though. However, once you get to the fairy bit, the advantage from Link's sword is gone and you die if you're hit once, so the difficulty spikes dramatically. For that reason, I added an easier way to complete that section (a hidden pipe to the left of the room making it so you don't have to ride all the way to the key and back, just having to take one trip), but it still maybe has a few more enemies than it needed to. 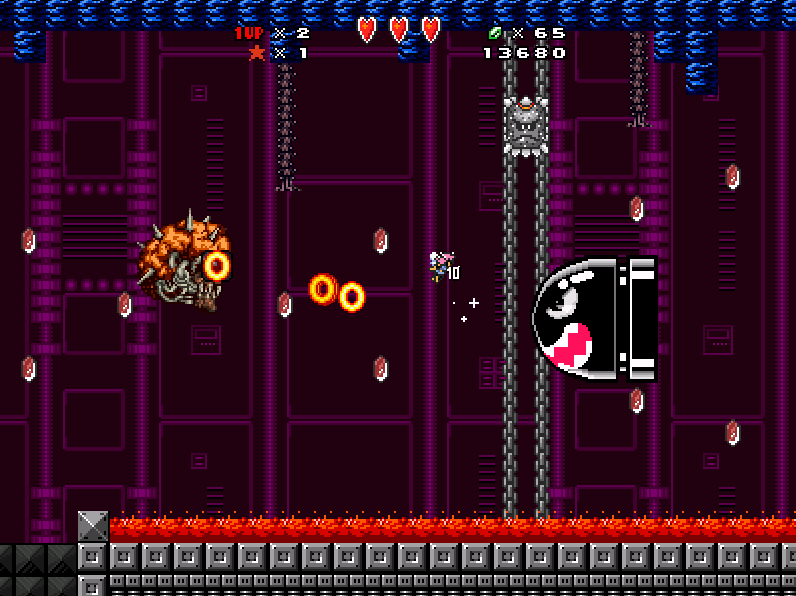 It's also possible to kill some enemies as a fairy by touching them from above, "jumping" on them, but that's risky and only really useful for the hammer-throwing propeller-shyguy. Even I have trouble with that room, so I can totally see why you might say the enemy density there is a little too much. As for the hidden key at the entrance, that's specifically designed to be hard to find, to teach the player that they're going to have to be observant in this level. I'm sure plenty of people will never make it past the first screen though, which is why I gave some tips in the OP in case anybody's stuck. It's unclear from your review whether you got the normal ending or the true ending, but I imagine some people wouldn't be interested enough to keep playing long enough to find the real ending. Teddy wrote: Thanks for the detailed overview. If you're interested, here's my rationale behind some of the things you took issue with. Teddy wrote: I felt like Link, with his sword, is pretty overpowered, so I could get away with putting a lot more enemies than you'd normally be able to in a Mario level. I would suppose that's fair enough. I'm just used to seeing what I would deem, I guess a proportional amount of enemies to the size of the level itself or something. Some areas I went to were fine and it just seemed like a couple had a couple too many and it made it difficult to pass. That's where I was feeling mixed about it. Teddy wrote: However, I feel like it's worth pointing out that there were ways to reduce the number of enemies. For example, when paragoombas infinitely spawn from pipes, killing the shyguy above them stops that. That's probably a little unintuitive for people who are used to playing Mario levels though. Teddy wrote: However, once you get to the fairy bit, the advantage from Link's sword is gone and you die if you're hit once, so the difficulty spikes dramatically. For that reason, I added an easier way to complete that section (a hidden pipe to the left of the room making it so you don't have to ride all the way to the key and back, just having to take one trip), but it still maybe has a few more enemies than it needed to. This is true that it's more difficult but I still liked it. Challenge is fun to me, but I didn't even think there was honestly a second way out of there so I'll be sure to check that out! I also think this was one of the areas I was putting into that 'few too many enemies' group. Teddy wrote: It's also possible to kill some enemies as a fairy by touching them from above, "jumping" on them, but that's risky and only really useful for the hammer-throwing propeller-shyguy. Even I have trouble with that room, so I can totally see why you might say the enemy density there is a little too much. Teddy wrote: As for the hidden key at the entrance, that's specifically designed to be hard to find, to teach the player that they're going to have to be observant in this level. I'm sure plenty of people will never make it past the first screen though, which is why I gave some tips in the OP in case anybody's stuck. 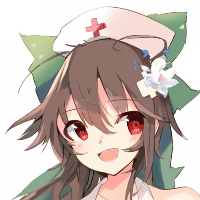 Teddy wrote: It's unclear from your review whether you got the normal ending or the true ending, but I imagine some people wouldn't be interested enough to keep playing long enough to find the real ending. I would assume in my first play I got the normal ending although I will be playing to get the true ending this time.